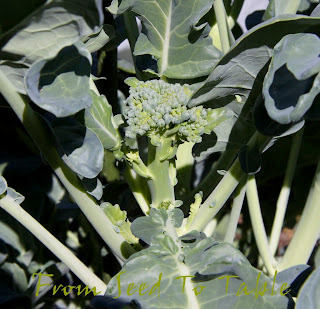 Di Ciccio broccoli returned to my garden this year after I had spent a number of years flirting with other sprouting broccoli varieties (Piracicaba and Apollo spent a few seasons in my garden). I'm so happy that I came back to this heirloom Italian variety. Generally it is a reliable producer of really good tasting Calabrese type broccoli shoots. There isn't much history that is easily available about Di Ciccio (aka Di Cicco). Apparently it was introduced to the American market in 1890, but who offered it and where it originally came from seems to be lost in the mists of the internet. The whopper, 2 lb., 2 oz, on June 15. 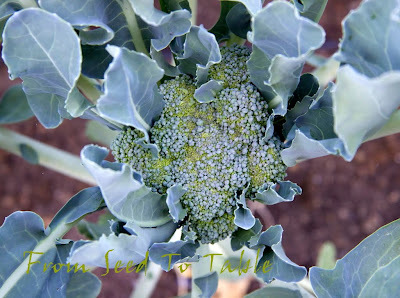 Not your typical head of Di Ciccio broccoli. I sowed the seeds for my current planting on February 22. For plants like broccoli I sow multiple seeds in a 4-inch pot and when they have developed a few true leaves I separate the plants and pot them up individually into a larger containers, in this case into quart yogurt containers that I had drilled holes into the bottoms of. I let the plants grow on a few weeks more and then set the best of the bunch out into the garden. I typically start at least twice the number of plants that I want because there are inevitable losses and runts. Shown below are the newly planted out seedlings on April 25 of this year, the Di Ciccio are on the left and there are 4 Purple Peacock plants on the right. 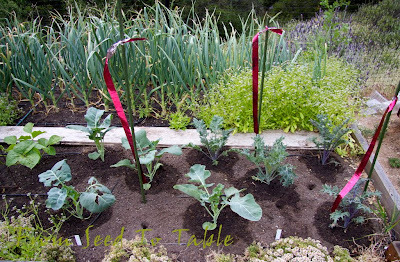 The red tape is a flash tape that I had to put up to scare the birds away, they were pecking the poor plants to shreds. Here's the very mature plants today. It's difficult to tell one plant from another in this photo, but the two plants on the left are quite large and producing large side shoots. The two plants on the right are much smaller and only produce a few small side shoots. I'm harvesting all the shoots I want from the four plants so I don't care if a couple of them are extra small and not very productive, they are probably just too shaded by the surrounding plants. I set the plants out about 18 inches apart. The plants would probably have been happier if I had given them a few more inches of space or if I had just planted 2 rows instead of planting them in a block. Di Ciccio produces small main heads that are usually 3 to 4 inches in diameter. This year one of my plants came out huge, it produced that whopper of a head shown at the top of the post, here it is as an infant, already 3 to 4 inches across long before it was ready to harvest. This head was more typical. 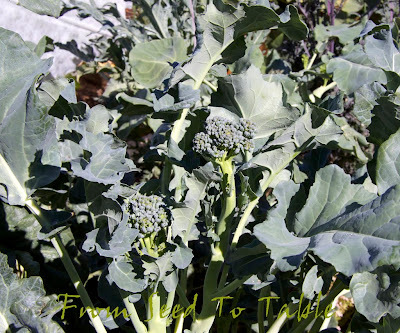 I like to let my broccoli florets get a bit loose so this head is larger than it would be if it had been harvested with the commercially typical tight head. A typical main head, weighing in at 13 ounces. The head shown below is still in the typical range, but just a couple of inches across. So, that is one of the few flaws of this variety, the production is highly variable from plant to plant. A minor flaw in my opinion. 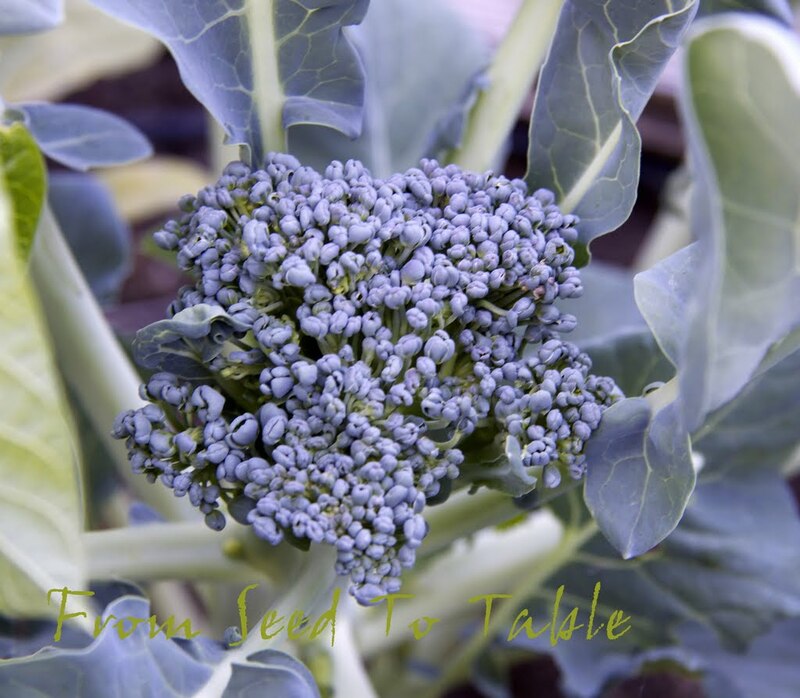 It makes it a little more difficult to plan how many plants to grow if you are seeking a certain level of production, but in general I've found that four to six plants produce quite enough to keep this household of 2 happy. 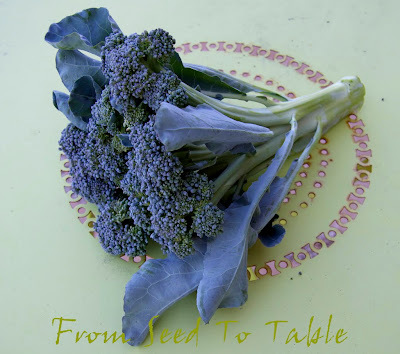 This year I also planted 4 Purple Peacock broccoli plants and the combined production of the eight plants has turned out to be quite enough for fresh eating. I never plan on preserving any broccoli, so if I wanted more broccoli for the freezer I would have to set out more plants. Here's a couple of side shoots on one of the larger plants before I harvested this morning. 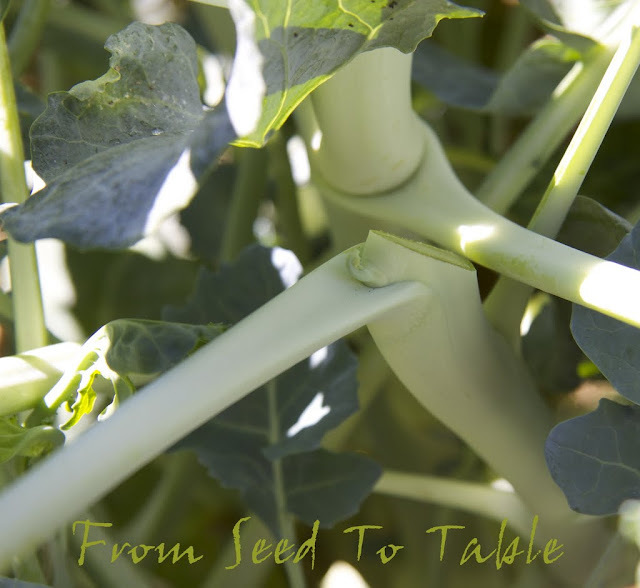 You can see what a nice long stem this other shoot has and the potential for a lot of new side shoots. And another nice long stemmed shoot with lots of tiny shoots in the leaf nodes. I think a lot of gardeners would be inclined to harvest the nice little head on top and leave all those potential little shoots. But look, I cut the stem close to the bottom of the shoot, leaving one good little bud and perhaps there's another one in the node of the next leaf down. I could not tell if there was a bud in the lower leaf node so I cut above the next one where I could see the bud. The plant will direct it's energy in that one bud and it should produce another nice fat long shoot, but just a bit smaller than the one just cut. 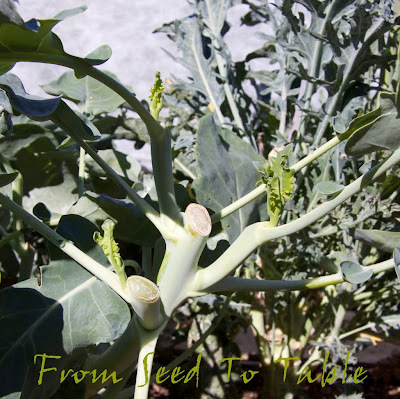 If I had left all those buds up and down the stem then the plant would have to spread it's energy amongst the buds and they would all be small. 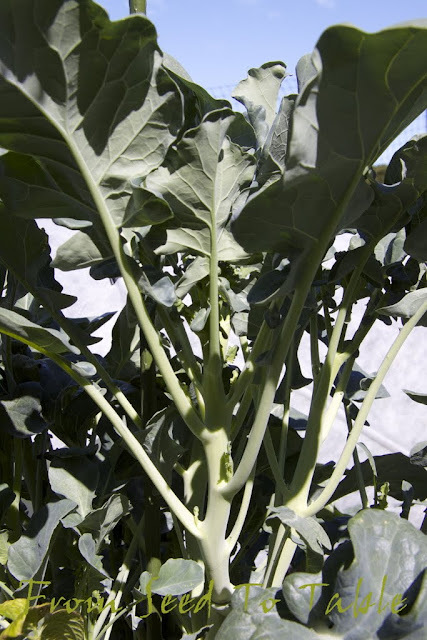 Eventually you would end up with a big plant that produces just short small shoots. If that's what you want, great, but I like those nice fat long shoots. Look what happened here on my smaller plant that didn't produce a lot of side shoots. I cut one of the larger shoots so that it had three buds remaining. I was hoping that the plant would get up some steam and direct a lot of energy into all the shoots. I did get three fairly nice shoots, you can see where I cut each of them down to one bud, but now there's three much smaller shoots developing. When I harvest these shoots I'm going to cut two of the stems out entirely and let the plant direct it's energy in just one stem and perhaps I'll get one long fat shoot again. 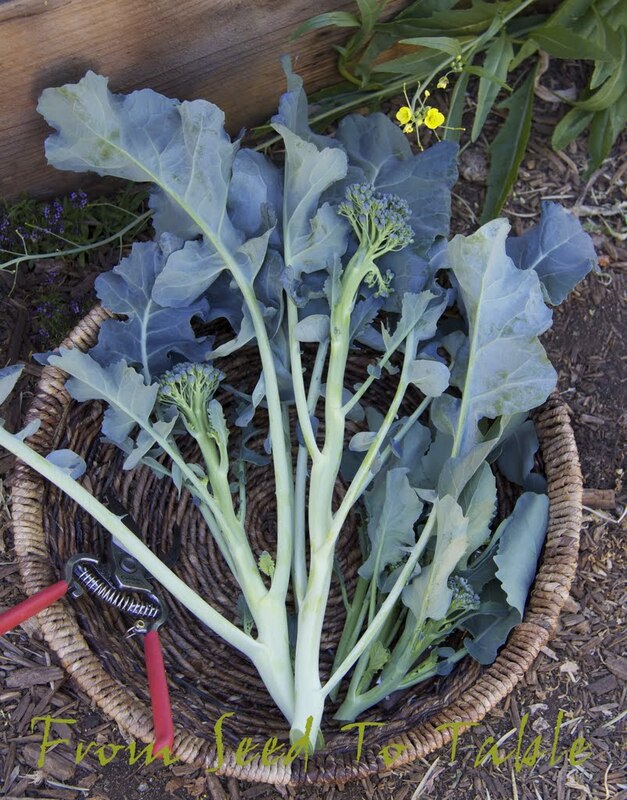 Here's the freshly cut broccoli harvest from this morning. Look at how long a couple of those stems were. 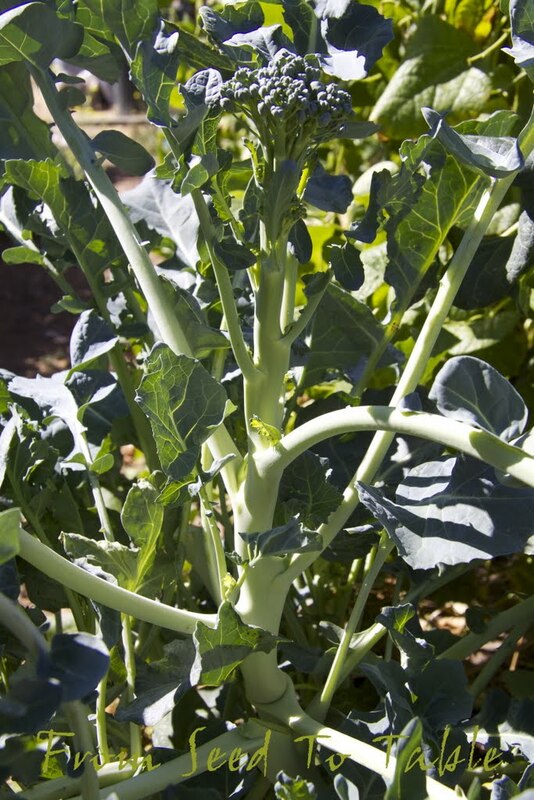 The bottom portion on those long stems is rather tough and so are the leaf stems. 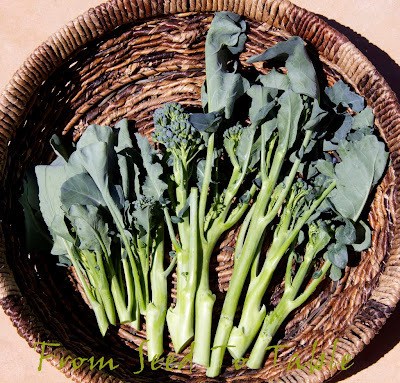 When I prep my broccoli shoots I cut off the leaves and remove the tough leaf stems (petioles). The leaves can be prepared like kale. 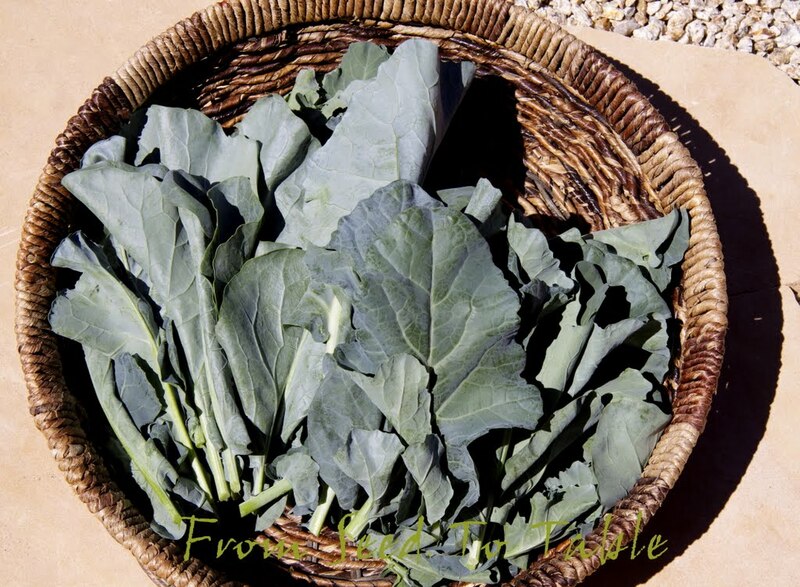 I used the leaves from the last bunch of broccoli in a frittata. I cut the main stems off where the skin is tender enough to cut through easily and save the tough skinned portions to peel. I love the broccoli stems, they taste like kohlrabi which is after all just the grossly fattened stem of a another brassica. 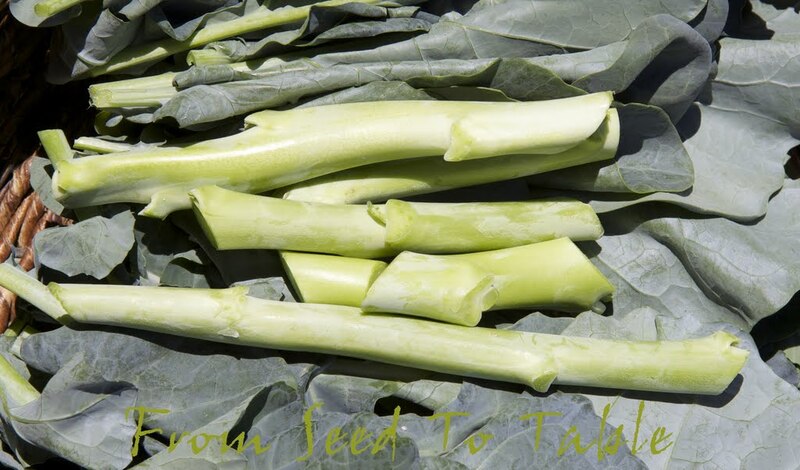 Often times I just munch the peeled stems raw. And here's the shoots prepped for cooking. Look how small the shoots are on the left, those are from the small plants. I'm glad all my plants didn't come out like that! 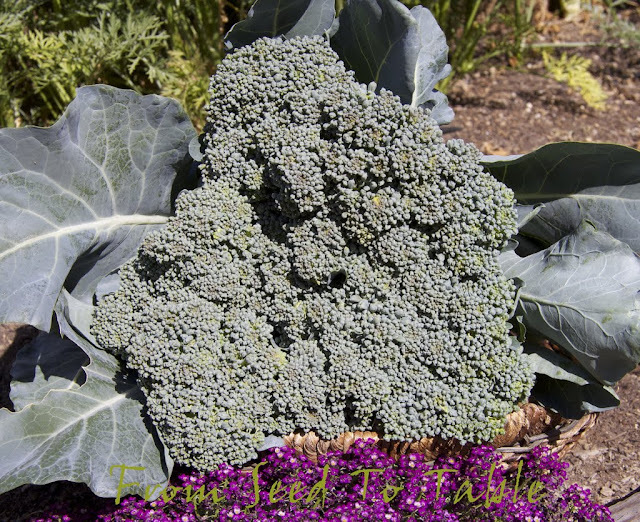 I'll be linking up with Liz on her blog Suburban Tomato where she maintains the list of Saturday Spotlight posts. 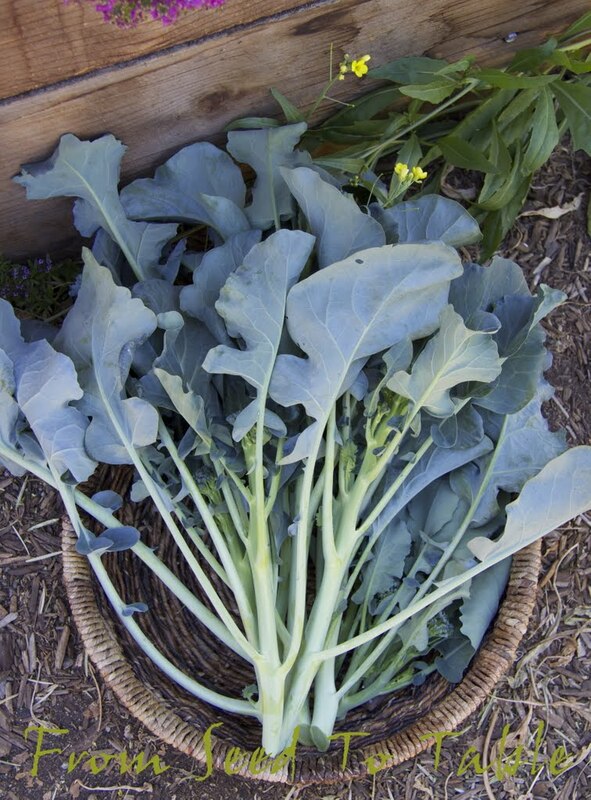 Head on over there to learn about all sorts of vegetables that have been *garden blogger tested and approved*. Thanks for the tutorial, you're right, I tend to cut just the top shoots, have to remember not to do that next time. 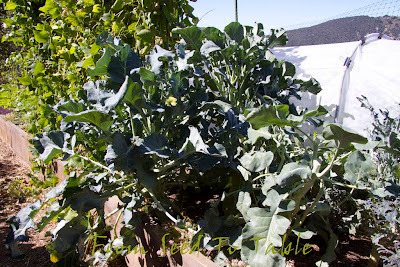 Brassicas don't do well for my area in spring, I plant them in fall and they start to bolt in early March. This spring I cut off too much on one of my plants. For some reason the shoot never developed. It is still sitting there with no shoots formed. I'm hoping it changes its mind, but after a couple of months of just sitting there I don't hold out much hope. At least the others are growing like they should. Good tutorial, I will have to study it. I'm not sure what I'm doing but its exactly what you are warning me not to do. Still not sure I will grow Di Ciccio again. Like you there was great variability in size. Two were very large and four small. Unfortunately for them, the large ones were in the squares next to the cucumbers and were shading them out. At this point I want my cucumbers, heck with a few shoots. Another weird thing this year, on many of the Di Ciccio I had suckers or shoots growing up from the base of the plant. Didn't notice them because I let them get bushy like I shouldn't. I've had plants sucker like that also and occasionally they are vigorous enough to rejuvenate the plant. More often though it's a bunch of small ones that amount to nothing.